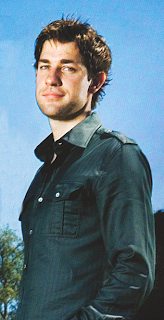 Actor John Krasinski will be Captain America in the Joe Johnston directed film "The First Avenger: Captain America." As we previously knew, Johnston and Marvel intended to hire a lesser name actor and surround him with bigger names. Krasinski is a perfect fit under the microscope that Paramount, Marvel and director Joe Johnston had in mind. First and for most, Krasinski has a perfect look for Steve Rogers and a WWII era film. Krasinski most well know for his role of Jim Halpert on NBC's The Office, will make a perfect specimen of the dweeb like Steve Rogers who becomes Captain America. Furthermore, Krasinski is not that far from obtaining a little definition that would give a more fit and muscular look for the role. And yes we all can imagine working a storyline on The Office where Jim begins a new workout regiment. I have been sitting on this news for a few weeks now, primarily because if I ran the scoop earlier, a close friend could have lost his job, not to mention the loss of his trust. Now that a few sites have scored the scoop, there is no reason to wait any longer. Over the time that I have stewed on this news, I have grown more and more excited. 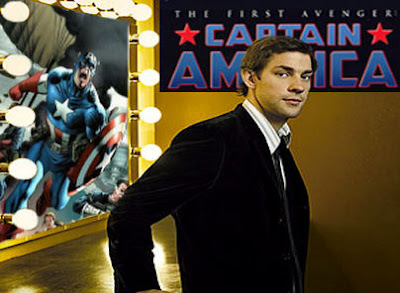 I have always liked John Krasinski on The Office and think he has the potential to be a perfect Captain America. Lastly, how great is it gonna be to see Robert Downey Jr., Chris Hemsworth, John Krasinski and Edward Norton sharing the screen in the upcoming "The Avengers" movie slated for 2012!?! I really like krasinski, but can we be sure this is the final decision? What about ackles and hedlund? Is it true jensen ackles is/was a frontrunner?